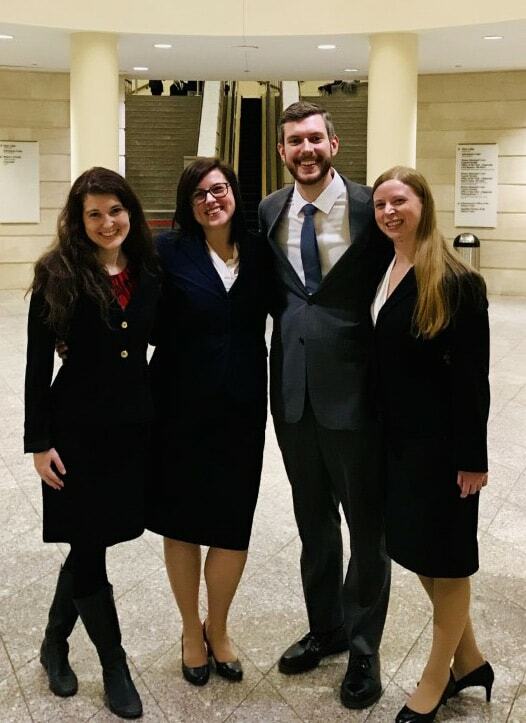 The University of Akron School of Law Moot Court Team dominated the American Bar Association National Appellate Advocacy Competition regional held in Boston from February 28 to March 2, 2019. Akron Law was one of four teams to earn a spot among the 24 that will compete at the national tournament in Chicago next month. Akron Law’s Law Moot Court Team, from left: Professor Jen Woloschyn, Lauryn Kitchen (3L), Michael Grund (2L) and Amanda Zganjar (3L). In addition to Akron, the field in Boston included teams from Harvard University, Boston University, Ohio State University, Northeastern University, American University, University of Arkansas, Michigan State University, Marquette University, Indiana University, Stetson University, Cleveland State University, St. Thomas University, Mercer University, Quinnipiac University, South Texas College of Law, and Oklahoma City University. The Akron Law team of Lauryn Kitchen (3L), Amanda Zganjar (3L), and Michael Grund (2L) won five consecutive rounds of extemporaneous oral arguments before claiming the title of tournament co-champion. In addition, Kitchen was named the second best oralist of the competition. In its 5-0 tournament sweep, Akron defeated teams from South Texas College of Law and from Mercer, Indiana, Oklahoma City, and Cleveland State universities. “It was truly a weekend of successes,” said Professor Jen Woloschyn (‘09), the team’s coach. Throughout the three-day competition, the judges consistently praised the Akron Law team for its legal arguments, creative use of scientific research and current events, and passionate advocacy on behalf of its clients, said Woloschyn. In its nearly flawless presentations, the Akron Law team dazzled with quick and thorough responses to difficult questions about complex constitutional issues. This year’s problem addresses whether certain fictitious prison conditions pertaining to adults and juveniles in solitary confinement violate the Eighth Amendment’s cruel and unusual punishment clause. Each team must prepare compelling arguments for both sides. The law students must objectively evaluate the law and identify the best arguments (and weaknesses) for each party. The specific legal framework for the problem requires each law student to intertwine legal analysis and statutory interpretation with scientific research, policy arguments, and current events. Woloschyn said a special thanks is due to the many professors and practitioners who provided invaluable feedback to the team, specifically: Professors Martin Belsky, Joann Sahl, Dean Carro, Margery Koosed, and Michael Benza, Dean Charles Oldfield, Jim Layton, and Chad Eggspuehler.